Omar Sy is natural when it comes to movies and comedies, as well as their components. Although he is from France, Sy’s remarkable works which speak volumes have been felt beyond Europe and has continued to pave way for him. You will surely remember the French actor and comedian in the very popular sketches with fellow comedian Fred Testo. Omar Sy also made a name with the popular comedy-drama ‘The Intouchables’ which earned him much popularity in the world of entertainment. Looking at his life, one can easily deduce that although he is a celebrity, Sy is mostly perceived as an ordinary man who lives an ordinary life. Apart from his on-screen endeavors, there is so much to be known about the comedian and actor. Omar Sy was born on January 20, 1978, to his parents in Yvelines, France. He was the fourth of eight children in the migrant family who emigrated from West Africa. His inclination to entertainment started at a very young age, however, he fully took the path after his high school in 1996. Sy made his way to Radio Nova that year and that was where his career kicked off. Meeting Fred Testot, they soon discovered they had a lot in common and formed a comedy duo. He first made an appearance in Le Cinéma de Jamel on Canal+ TV channel. The actor soon created a TV show Le Visiophon which earned him great popularity. More TV and stage shows like Je ne fais pas mon âge, Service après-vente des émissions, Omar et Fred: le spectacle, and others followed; further projecting Sy to the world. Having caught international attention, he played a voice role in Disney movie Brother Bear (2003). His voice was also featured in the French version of the Tomb Raider Legend video game. In 2006 Sy made an appearance in a game show Fort Boyard. In 2008, he alongside Fred Testot voiced some characters in the French animated movie Logorama. Sy was cast in the comic drama The Intouchables in 2008. The movie grossed millions, garnered millions of views as well as stayed on top of French Box Office in 2011. The movie which exceeded expectations earned Omar lots of accolades for his remarkable role. He bagged the 2012 ‘Globe de Cristal’ for Best Actor, the 2012 ‘César Award’ for Best Actor, and many others, and also earned a nomination for Best Actor in ‘Sattelite Awards’. The actor and comedian made an appearance as ‘Bishop’ in X-Men: Days of Future Past, the seventh installment of the X-Men series. He also made an appearance in Jurassic World (2015). Omar Sy is really private about his personal dealings and for this reason, it is difficult to find out his actual net worth. But according to some sources, the actor and comedian has a net worth estimated at $3 million. He enjoys a comfortable life and makes little noise about his personal affairs. Omar Sy may be very outgoing or dramatic on the screens but this does not mean his life is the same. The French actor and comedian is a traditional family man who upholds the value of marriage and communal living. Omar Sy has been married since 2007 to his wife Hélène, who is of Fench ethnicity. The couple met in 1996 when they were both young hustlers. Helene at the time shared an apartment with a friend who was an artist. It all began on a fateful day when Omar was invited over by the artist for business discussion but was welcomed instead by Hélène, her friend. 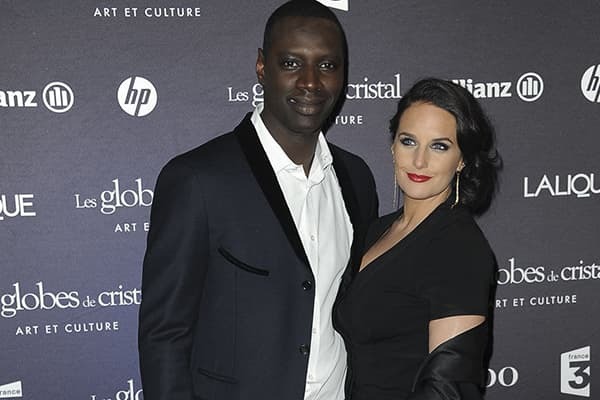 Omar Sy was going to make the woman who welcomed him, his own woman forever. The two soon became platonic friends, a friendship that later led to a romantic relationship. The couple dated for 10 years before they got married in Le Tremblay-sur-Mauldre, a suburb of Paris, France. They have five children. Omar Sy is a Muslim by religion. He practices as well as upholds the doctrine of the Islamic fate. Omar and Hélène’s first four children, two girls, and two boys were born before they were officially married. The couple who are private with their personal life hide their children away from the public and never post photos of them on social media platforms. His wife is very much involved in charity. In 2005, Hélène formed the CéKeDuBonheur association, a charity aimed at helping helpless hospitalized children. In 2006, Sy was nominated for ‘Best Kiss’ at the NRJ Cine Awards. Omar Sy also dabbled in music for a while. In the year 2010, he released Bleu, Blanc and Rouge with his on-screen associate Fred Testot. Winning the 2012 César Award for Best Actor made Omar Sy the first black actor to bag the award for the same category.